All profits go to the PuppyUp Foundation. If you are participating in the 2017 Little Rock PuppyUp Event, I would be honored if you would wear a Penelope T-Shirt. She fought cancer bravely for over a year, but lost the battle & crossed the rainbow bridge on August 31, 2017. For each PuppyUp Walk, the Event Manager and their Walk Team select both a Human Cancer Hero and a Canine Cancer Hero, to be honored during the Walk ceremonies. These Heroes are chosen because of their exemplary attitude towards their particular type of cancer, showing bravery and hopefulness in their fight against this terrible disease. This year’s Canine Hero is Penelope Miller. Cancer touches everyone. No doubt, it has touched someone in your life. If not, you are truly blessed. This sweet girl is Penelope. She is my favorite breed — a rescue dog. She came into my life about 7 years ago. I vetted her and found her a home, but she came back about a month later. Unfortunately the dad was allergic to her dander and, although it broke their hearts, they couldn’t keep her. I welcomed her back into my home and started looking for another family to place her with. I thought I had found one, but when the subject of dander came up, I just couldn’t risk putting her through that again. So, Penelope became a permanent member of the family. In August of 2016, I took Penelope in for a checkup. She had been losing weight and her appetite was way down. X-rays showed a large mass in her abdomen. She had a nephrectomy (right kidney removed). The diagnosis was bad: Renal Adenocarcinoma, a very aggressive, malignant tumor. She was only given 6 months to live even with a successful surgery. There was a new cancer treatment available called VetiVax. I decided to give it a try. Three immunotherapy injections were created from her tumor tissue. She received one shot a week for three weeks and we hoped for the best. She also had a small mass removed from her right thigh. It turned out to be a completely different, but still malignant, type of tumor. With clean margins, surgery was expected to be curative for that tumor. Monthly labwork and x-rays showed no tumor recurrence through May of 2017 — three months past her prognosis. We were honored by Penelope being chosen as the Canine Cancer Hero for the Little Rock PuppyUp Walk in November this year. I have participated in this PuppyUp Walk since my Pit Bull Jade died from cancer in 2012. I never dreamed I would face cancer in another one of my dogs. In June of this year, I discovered a growth on Penelope’s right side. A visit to the doctor for x-rays confirmed the worst. Not only had the cancer returned, but it had metastasized to her chest. Another surgery wouldn’t help. Since then, she has developed a number of smaller nodules similar in appearance to the small mass that had been removed from her thigh in August 2016. She still wags her tail and cuddles with me and is excited to go on walks. But the walks are getting slower, with more rest stops, and the last few days she hasn’t wanted to eat much. 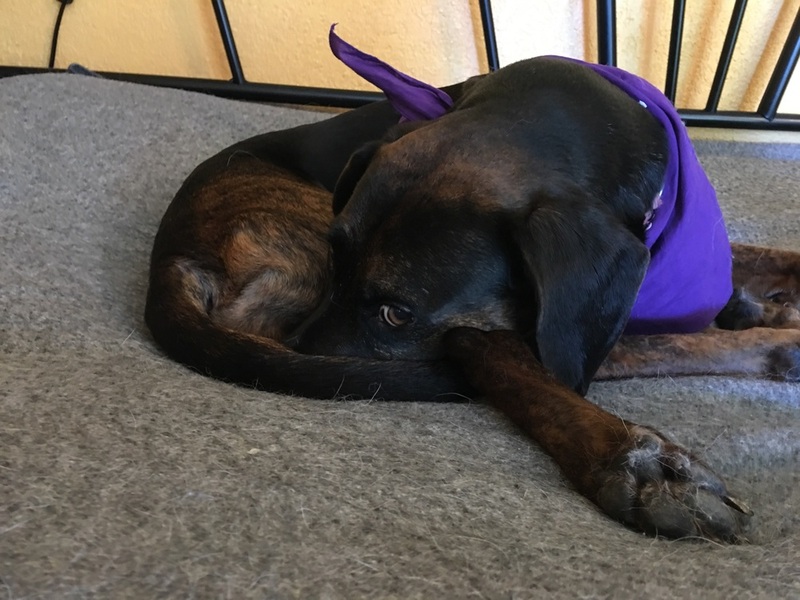 Please join me, Penelope and the Puppy Up Foundation in this good and valuable work to raise Canine Cancer awareness, as well as funds for research in both human and canine cancer. We can develop a cure — with your help. Penelope crossed the Rainbow Bridge on August 31, 2017. Will you consider purchasing a shirt in Penelope’s memory (or in honor of a loved one you know who has or has had cancer)? And join us in Little Rock on Saturday, November 4th for the PuppyUp Walk at MacArthur Park.